Dal is a staple in several Indian homes and usually eaten with piping hot steamed rice or Indian flatbreads. It is the most important dish in the typical Indian Thali Meal. Every occasion whether special or ordinary…DAL has to be included in the menu! Traditionally, yellow lentils or a combination of lentils are used to prepare dal and tempered with simple spices. It is the method of tadka/tempering, combination of dals and addition of vegetables or/and meats which enhances & defines the dal preparation. There are quite a few recipes for dal tadka and dal fry but the North Indian Dhaba style one is most popular. The North Indian dhaba style dal and most homes in Punjab have a smoky flavor as food is cooked over wood fire. In Pune, we have quite a few authentic Punjabi dhabas which are run by Punjabis. The food is so delicious and awesome. Today’s recipe is Dal Tadka which is also popularly known as Tadka Dal/Dal Tarka, is healthy, hearty, beautifully textured, smoky flavored Indian preparation which is loved by many. Like most people who love dal, we too love it with Indian breads and rice but I love to eat it plain and savor the taste! The heady aroma of tempering/tadka when prepared at home is just mind blowing! I like to use some homemade ghee/clarified butter which lends a lovely rustic flavor to the dal. The simplest of dishes make a fantastic meal. A perfect meal for me is dal, rice, rotis, subzi, salad, papad, pickles & buttermilk. Another way I like to enjoy dal is with steamed rice & a topping of warm Desi ghee. Give me a vegetarian thali any day and see my face glow! First pick, winnow and wash the dals. Soak the dals for 30-40 mins. Place the dals in the cooker body along with a teaspoon of salt and 2 cups of water. Bring the dal to a boil without the lid. Skim off the impurities which arise on boiling. Add in the chopped onions, tomato, green chillies, ginger, asafoetida and turmeric powder to the boiling dal and mix well. Pressure cook the dal for 4-5 whistles or till done. Whisk the cooked dal to a smooth creamy consistency. 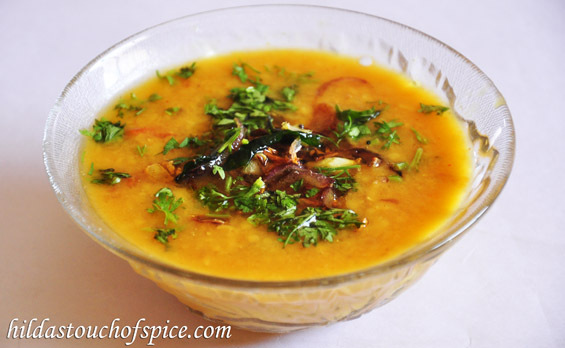 If the dal is too thick then add some hot water to achieve the desired consistency. Place the dal on the flame and add crushed kasuri methi, sugar and let it come to a boil. Reduce heat and let it simmer for about 4-5 mins. Adjust salt to taste. Switch off the flame and cover the dal with a lid. Heat oil/ghee in a tempering pan. When hot add the cumin and fry them on low heat. Keep stirring till they are well fried. Do not burn them. Add the dry Kashmiri chillies, curry leaves, hing and chopped garlic. Fry on low heat till the garlic turns lightly golden. Pour the tadka on the dal and cover with the lid immediately. Serve the dal with steamed rice/jeera rice or with your favorite Indian bread, garnished with crisp fried onions and chopped coriander leaves.